Alongside Software as a Service (SaaS) and Platform as a Service (PaaS), Infrastructure as a Service (IaaS) is one of the core service models of cloud computing. Under the Infrastructure as a Service model, customers (often enterprises rather than individuals) are permitted to provision and access virtualized hardware and resources - such as servers, networks, storage, or virtual machines. The customer does not hold the responsibility for maintaining or developing those resources, but instead is free to focus on managing the higher level resources, such as the platform or operating system and the necessary software. In this way, customers can pay only for what they consume, while providers are also free to sell unused resources, leading to substantial opportunity for cost-savings and efficiency gains for both sides. 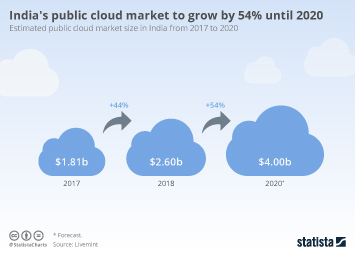 Infrastructure as a Service currently represented about a fifth of the overall cloud computing market in 2017 and public cloud IaaS revenues are expected to rise significantly over the coming years, from around 30 billion in 2017 to 83.5 billion by 2021. Cloud infrastructure's overall market share, however, is expected to fall, as it loses some ground to the maturing Platform as a Service (PaaS) market. On the other hand, analysts have also pointed to the difficulty of assessing the various cloud services markets in isolation. Some suggest that a significant portion of spending on cloud software and platforms, for example, will naturally go towards cloud hardware and software that supports cloud infrastructure. In the Infrastructure as a Service market, the largest companies by revenue are currently Amazon, through its Web Services offering; Microsoft, with Azure; Google, via its Compute Engine; and IBM, with its SmartCloud Enterprise. However, while Amazon is currently the largest vendor of cloud infrastructure by some margin, its hold over the market may lessen as Google and Microsoft make headway, and surveys suggest there are plenty of other companies fighting for a piece of the cloud infrastructure market. More interesting topics from the industry "IT Services"